It would consist of 200 social houses and apartments and 340 affordable homes. A PLAN FOR a massive development of social and affordable houses in south Dublin has been approved by councillors. 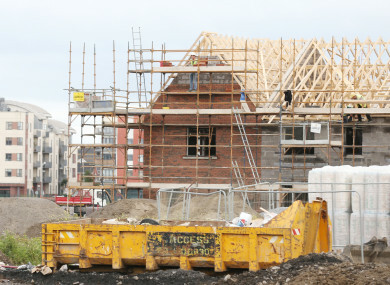 The plan was approved earlier this week by councillors in Dún Laoghaire-Rathdown County Council and the ambitious project would see council lands in Shanganagh turned into an affordable and social housing scheme. The land was turned over to the council in 2009 when an open prison on the site closed. A group of councillors from across the chamber and across the political groupings has come together to tackle the lack of social and affordable housing in the borough. Sinn Féin councillor Shane O’Brien is one of the councillors who presented the plan to council chief executive Philomena Poole. He told TheJournal.ie that the plan was formulated to address serious problems in the area. The plan will see three-bedroom homes on sale for between €180,000 and a maximum of €247,000. 200 of the homes will belong to the council, 200 will be affordable housing and 140 will be rent-to-buy. O’Brien says the plan will help address a serious backlog in housing lists in Dun Laoghaire-Rathdown. “There is now over 5,500 waiting on social housing lists in Dún Laoghaire Rathdown and thousands of other individuals and families who do qualify for social housing support that are struggling to pay rising private rents, and whom will never have any form of secure tenure without support. “As local politicians we need to think outside the box in order to deliver social and affordable housing units in our area. The council will now put a proposal to Housing Minister Eoghan Murphy for a capital loan of €125 million to fund the scheme. A further €42 million will come from council and existing housing plans. Email “Councillors approve a plan for 540 affordable houses in south Dublin”. Feedback on “Councillors approve a plan for 540 affordable houses in south Dublin”.